Home / Health and Vitality / Cacao nibs and detox – the delicious treat for an extra clean sweep! We’ve been assisting our bodies in the elimination of dangerous toxins that can lead to illness and disease for thousands of years. Indeed eliminative herbs with laxative, diuretic and blood purifying properties have long been harnessed by a variety of cultures. The Chinese for example, have been taking herbal prescriptions for detox since 2700 BC. Colonics has been employed as an effective detox technique since 1500 BC and sauna as a popular form of cleansing since 1112 BC. Thankfully, these days there are a number of powerful superfoods that give our bodies a rigorous clean sweep, without us having to resort to complex and foul tasting herbal remedies. And you’ll be pleased to learn that delicious raw cacao nibs is one of them! There are a number of important ingredients in cacao nibs that are responsible for their first-class ability to cleanse and detox. These are examined in more detail below. The type of fibre found in raw cacao nibs helps to thoroughly cleanse our intestines and regulate our bowel movements for the efficient elimination of harmful toxins and pollutants. Raw cacao contains more antioxidants even than red wine, green tea and blueberries. These antioxidants actively improve the functioning of the endothelial cells that line our body’s circulatory system, which plays a crucial role in the cleansing and detoxification of our body. 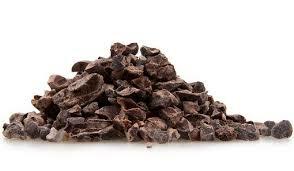 Cacao nibs contain a whopping 272 mg of magnesium per every 100 grams. Magnesium combats the build up of acid (correcting a state known as ‘acidosis’ in which most disease thrives) and neutralises the toxins in our body. Worryingly, some 7 out of 10 UK women are currently estimated to have an inadequate intake of magnesium. Iron forms part of the oxygen carrying protein, haemoglobin, which keeps our blood healthy. Healthy blood ensures that metabolic waste is removed and carried away from our bodily tissue. The manganese found in cacao assists iron in the oxygenation of the blood and the formation of haemoglobin. Cacao nibs are extremely rich in chromium, a trace element that helps to detoxify our liver from the alcohol that builds up during the fermentation process of sugars and starches and has a major influence on blood cleanse. Zinc is necessary for the healthy function of our liver and skin – both key organs that are heavily involved in the removal of damaging toxins from our body. Raw cacao nibs are a pure and totally unrefined snack that contain zero fattening sugars or dairy products and almost no caffeine. They can be enjoyed straight from the bag or combined with nuts and dried super fruits to prepare a tempting trail mix. Alternatively you can try scattering your raw cacao nibs onto breakfast cereals and desserts or using as an integral ingredient in your favourite raw cakes and chocolate bars. The post Cacao nibs and detox – the delicious treat for an extra clean sweep! appeared first on Superfood blog - Healthy, Rawfood Lifestyle.